This “nonarchival giclee print” by Hillsboro artist Nolan Winkler is headed to the office of a local dental hygienist. The piece was shot before glazing to bypass glare in the photo – only way to keep it this gorgeous-looking while glazed is to use super-expensive Museum-quality glass – come by sometime and we’ll show you what it looks like! 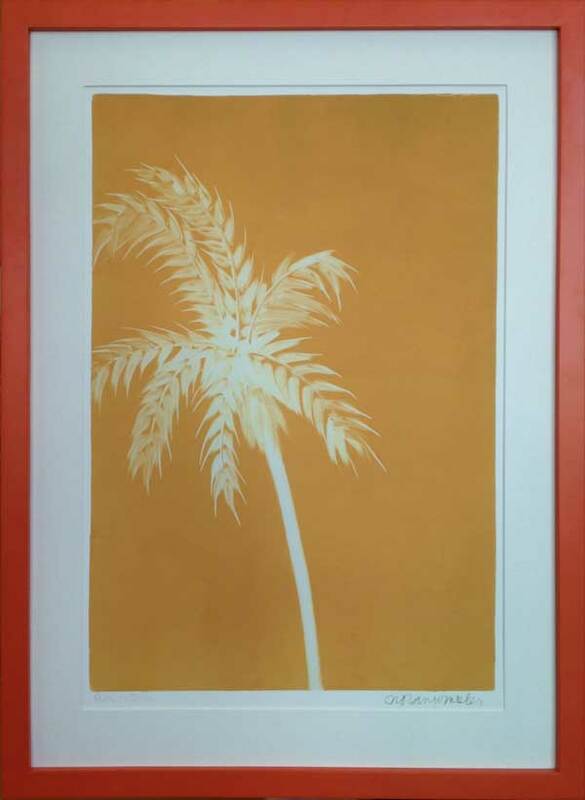 Before “Palm on Ocrhe” went out the door it got the conservation clear glass treatment because 1) like said, it’s non-archival ink and 2) we should really be using UV protective glass in every event what with the abundance of light here in New Mexico. Artwork fades in any kind of light, and so do mats, especially brightly colored mats. We have a small group of prints and posters by Ms. Winkler, and hope to post more of those images here soon. Meantime, for more information on Nolan Winkler, follow her on Facebook (which we currently cannot find) or better yet, visit her website.